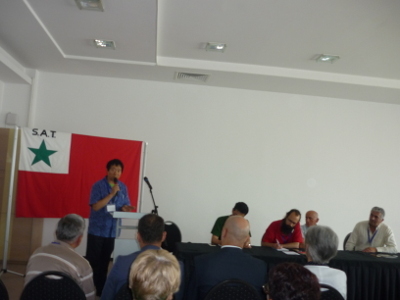 The 91st SAT congress has just taken place in Kragujevac (Serbia) from August 5 – 12. With its 180,000 inhabitants, Kragujevac is the fourth largest city in Serbia and unusually interesting historically – in the early 19th century a capital of Serbia and location of that country’s first industries, notably the VTZ arms factory, out of which developed the Zastava car and truck factory much later. Yet it is absent from the usual tourist itinerary and for that reason a good place to observe the life of the country. 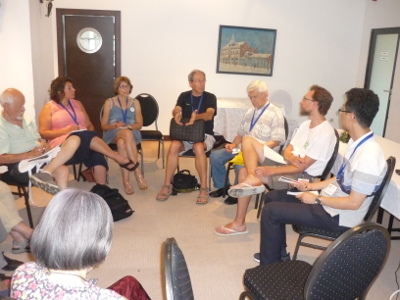 The theme of the congress was “Esperanto and transnational communication in the age of communication technologies”, not only a topic of current interest, but also a real challenge for SAT and other organisations that use Esperanto. New internet-based modes of communication have great appeal as they promise better networking among members, but they also make formidable learning demands on them. So it is easy to understand why SAT, with members all around the world, is turning its attention to such matters. One meeting held during the congress discussed “how to build a web-based system for decision-making in order to facilitate the participation of SAT’s members in its day-to-day operation and thus democratise its administration and structure”. An attempt was made to allow members not attending the congress to take part via the web. The idea of selecting a web platform that allows a geographically spread-out group or organisation to institute direct democracy has been brought up. SAT has always tried to maximize the participation of members in its running, but such technology is a new matter, one that members need to learn more about. Closer to implementation is a proposal to carry out regular opinion polls among members. This year’s Directive Resolution “supports the proposal that the Executive Committee hold regular internet opinion polls among members on topics specific to SAT and on general political and social topics”. Not every problem has a technological solution. The attending members expressed regret that some are using one “old” communication channel inappropriately: the mailing list. The Directive Resolution “desires that SAT-diskuto improve through participation of more comrades and creation of a less chatty and more serious atmosphere of debate within it”. 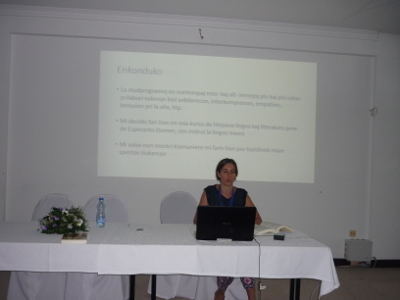 Aside from communication, other topics of political, cultural, historical and artistic interest, as well as entertainment, had a place in the programme: “Ecological aspects of veganism”, “(Korean) children’s books and how they relate to history, society and workers”, “The Esperanto Centre in Rumonge [Burundi]”, “Can Esperanto serve as a tool in high school education to cultivate the ability to feel, think and act extranationally?”, “Balkans – an insulting term?”, Esperanto mailing lists, Marko Kraljević, Esperanto in Banja Luka, an exhibit and a workshop devoted to patchwork, depiction of Zamenhof in art, Portuguese literature, Esperanto grammar, Serbian folk poetry and folk music, the invention of photography and mountain wildflowers. Two recently published books were presented, one dealing with the experiences of Esperanto-speakers during the 1st World War, and the other an autobiographical account of an Esperanto-speaker who experienced the Spanish Civil War and its aftermath. 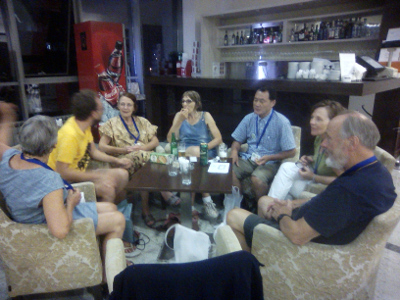 Several of SAT’s platforms (traditionally called “factions”) met: libertarian, communist, ecological, anationalist, vegetarian; as well as the Esperanto promotion group and the LEA Committee (a body that coordinates activity of workers’ Esperanto groups based on language territories). 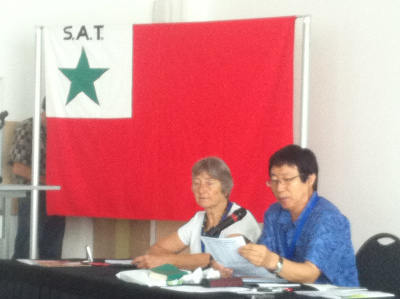 Pursuant to a discussion during the meeting of the Esperanto promotion group, the Congress encouraged the establishment of a group charged with the task of creating and improving articles on subjects related to SAT in Wikipedia. The organising committee of the congress deserves particular gratitude for this year’s rich cultural and artistic programme. It benefited from the fact that a professional actor headed the committee. Participants enjoyed an outstanding evening presentation of Serbian folk music and dance in the city theatre, concerts by Esperanto-speaking artists and a presentation by Verda Banano of Jordi Galcerán’s play La Kredito. The final evening concert featured a Serbian women’s group and Roma songs presented by Saŝa Pilipoviĉ and a surprise guest – the outstanding Serbian opera tenor Voja Spasić. The congress was able to relate with the populace of Kragujevac on several occasions: at the official reception by the mayor and during the cultural events, which were open to the outside public and bilingual. 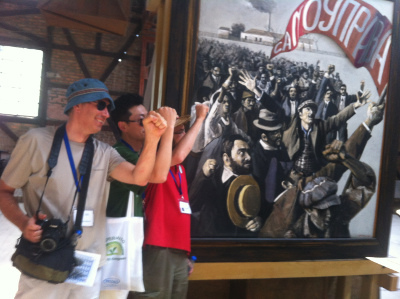 An excursion led through the historic city centre with the old military factory, one building of which has been turned into a museum, in which some exhibits depict the struggle of the workers’ movement for self-administration. Another led to a memorial park and museum on the outskirts of the city, dedicated to several thousand victims of Nazi terror shot there on October 21, 1941. A one-day excursion went to Manasija monastery, the Resava cave and the Veliki Buk waterfall. 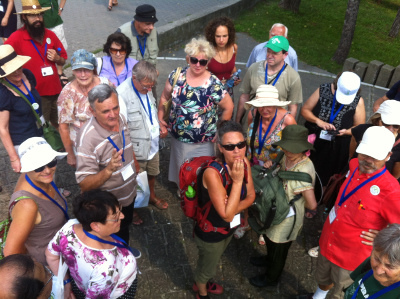 A three-day post-congress excursion went down “paths of wine and history” in the mountains of eastern Serbia. By holding an annual congress of its own, SAT is not only able to offer a varied programme, but enables members and non-members to remain in close contact with one another. This inhibits gradual amalgamation with the Esperanto milieu that defines itself as “neutral” – with which SAT nonetheless maintains friendly relations.